What it’s about: It’s 1799 and the Dutch East Indian Company has the only window into shuttered Japan, a tiny island called Dejima in the harbor of Nagasaki, from which they are allowed to trade sugar, cotton, and other goods for Japanese novelties and precious copper. Clerk Jacob de Zoet’s coming to Japan is less by choice and more by necessity, as he hopes to win the blessing of his sweetheart Anna’s family on his return to Holland. But five years is a long separation and Jacob finds his heart captured by Orito, a bright Japanese woman who is studying medicine and midwifery from the Dutch doctor. Troubles of the heart are the least of his worries though, as he has few allies on Dejima. He’s been tasked with investigating corruption from the previous administration and his findings are exposing the misdeeds of those still in power as well. His principles make him even less popular as he refuses to turn a blind eye as officers skim money and goods. A natural linguist, Jacob begins to illegally learn Japanese and befriends some of the interpreters who are never far from the Dutch officers. Still, navigating foreign politics and protocols can be dangerous, as Jacob finds himself in a battle of wills with the powerful Lord Abbot Enomoto, master of a mysterious shrine from which recruited nuns never again emerge. Though David Mitchell is one of my favorite authors, I was originally apprehensive about the plot of his newest novel. I love historical fiction, but not necessarily the colonial period, which can be a but dreary and heavy on nautical themes. But I shouldn’t have doubted Mitchell, because although there are plenty of ships, he has crafted a beautiful human drama that encapsulates a love story, political struggle, murder, intrigue, and mysticism. The cultural clash between the Dutch and Japanese is one of the most fascinating elements as we see the Japanese slowly coming to terms with the wider world and realizing that their isolation may have irreversibly handicapped them. My favorite section actually takes place away from Dejima, in the heart of Japan in Lord Enomoto’s cloistered shrine. I won’t give any more away. Would I recommend: Yes! Mitchell is a master of language and a captivating storyteller. His Cloud Atlas is still one of my all-time favorite books because of his stunning ability to capture voice. He’s able to do what many writers of historical fiction cannot: paint a picture of the past that is both accessible to a modern audience but also authentic and raw. 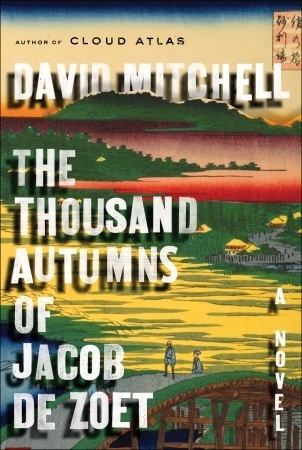 Though I maintain that the title is far too long, The Thousand Autumns of Jacob de Zoet was a wonderfully fulfilling read.